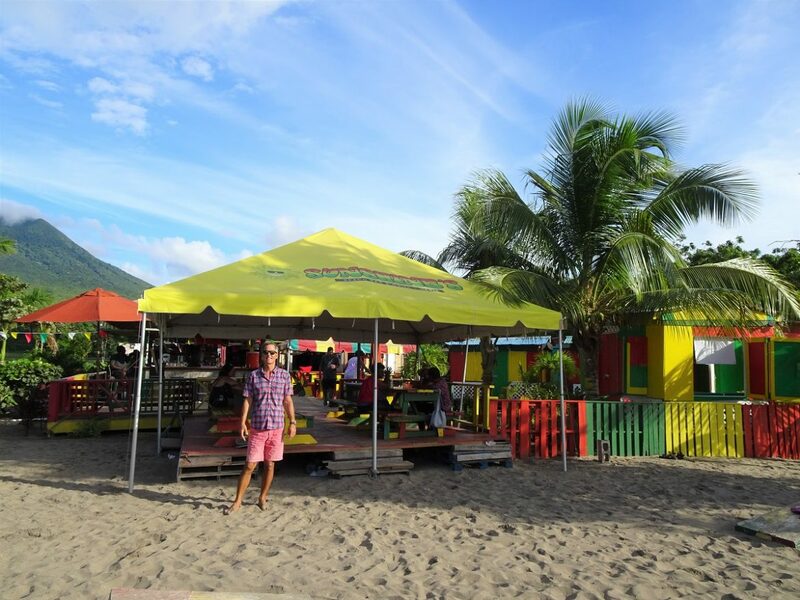 Wednesday 9 January: From Salt Plage in St.Kitts to Pinney’s Beach on Nevis. After 10 days in St.Kitts, it is time to move on and by mid morning we are ready to lift the anchor. Farewell Salt Plage and St.Kitts, we’ve had a great time visiting you. It’s a very short passage today, only 6 miles to the anchorage near Charlestown on Nevis. It’s slightly upwind so we decide to motor, in order to charge the batteries, make some water and heat the water for nice showers later. And in any case, the engine has been on holiday for too long – time for a healthy workout for it. While crossing the Narrows between St.Kitts and Nevis the sea is quite choppy as the wind funnels through the gap between the islands. But just 20 minutes later we are in the shelter of the island again. 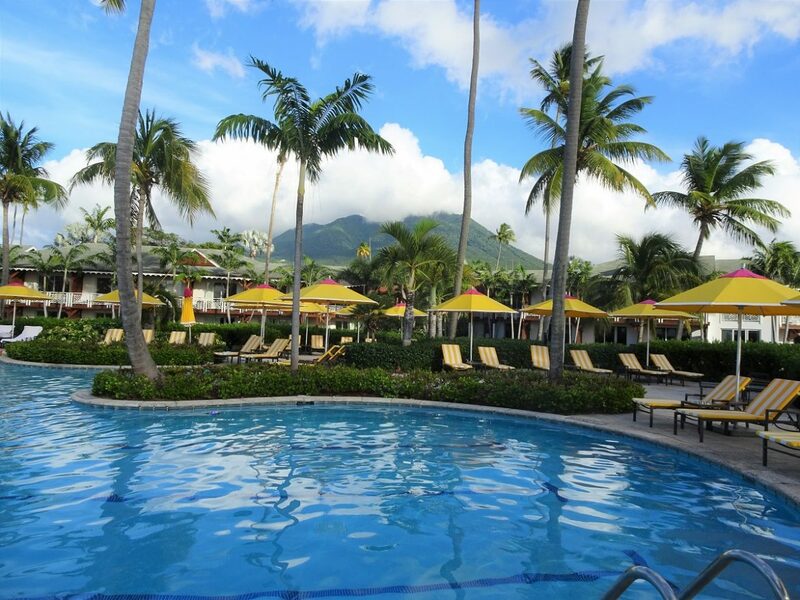 Hello Nevis! While we approach the anchorage, passing Four Season resort, we have a very nice view of the volcano, which has a small cloud over it today. Its very green tropical slopes are pristine with zero sign of any buildings spoiling its natural state. Quite a sight to see. We can’t anchor right next to Charlestown, but we do motor all the way there anyway to see if we can dock the dinghy on the town quay. And there seems to be a place for dinghies. Anywhere else along this coast the only option is to beach the dinghy and hope for the best, from a security point of view. Back in the mooring area at the foot of the volcano, we choose our spot and drop the anchor in 5m of blue water, over sand. Glen goes for his usual swim to check the anchor and we are well set. Most boats are on mooring buoys, but we prefer to anchor, as always. It’s pretty hot around midday so we leave it till late-afternoon before heading ashore to explore the surroundings. 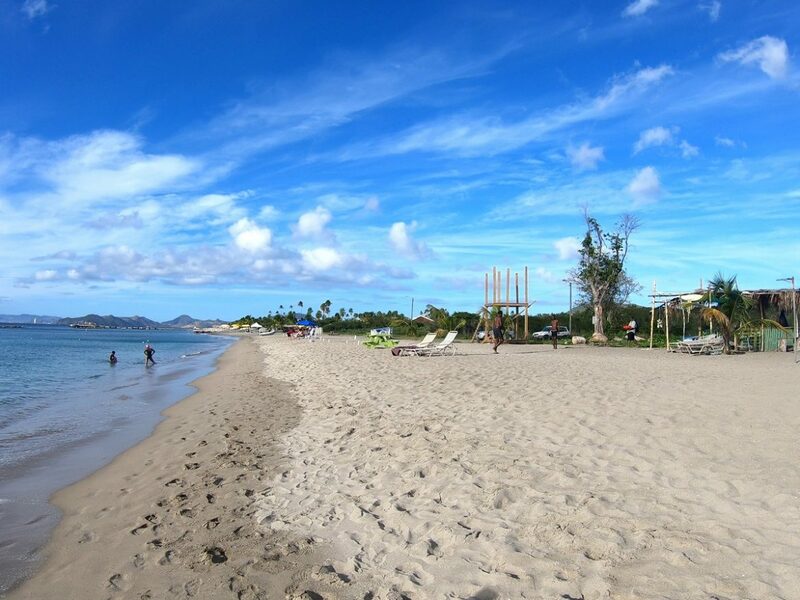 Pinney’s Beach is a nice long stretch of golden sand beach, home to several beach restaurants (huts) and the Four Seasons resort. We land the dinghy on the beach, and it was not exactly easy to haul it up the steep slope. Not good for our aging backs! But we do manage to pull it up most of the way, and for the last struggle we have a kind man helping us. We’ll have to think of a better method of getting it up a beach other than commandeering the closest tourist to help. Once safely up and away from the waves, we start our exploration with the Sunshine’s bar and restaurant. It is a popular venue from what we’ve heard, the typical hut looking place. But when we got there, only few people about and it was rather quiet. We look at the food menu and are again surprised at the prices these beach shacks manage to charge for simple deep fried bar food. So we continue our stroll towards the Four Seasons resort. Despite a guard on the beach, we walk straight in. The resort was renovated last year, and it shows, all the facilities are impeccable. It has a very nice feel to it, with lush gardens surrounding the pools. And from the beach the view with the volcano in the background is quite impressive, towering lush green over the island. 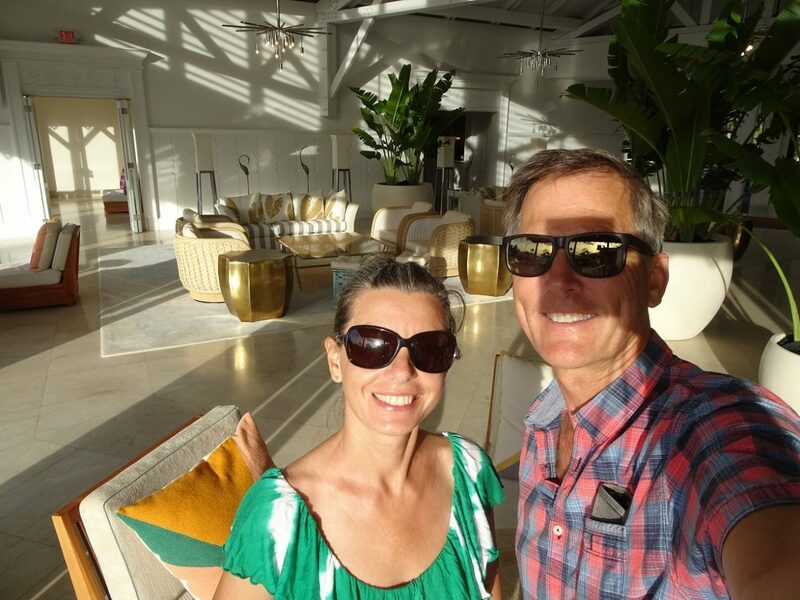 We have a leisurely walk through the resort grounds, admiring all aspects of it, and before sunset we are ready to sit for our late lunch at one of their bars. When we order our drinks, Ernstine, the bartender, asks us “Cloudy Bay?”. We are a little bemused, but answer “yes, that’s us”. He goes onto explain he recognized our accents and faces from our You Tube videos. Wow, how about that! And we end up having a very pleasant chat to him about the best places to visit on Nevis. Meanwhile, the sunset was just a glimpse of the sun in between the rain clouds, before it went under yet more darker clouds. Ernstine recommended us the Turtle Time restaurant here on the beach, a mixture of Creole and Asian dishes, and on the way to the dinghy we stop by to look at their menu. It does look interesting so we will probably pay them a visit in the coming days. Back at Cloudy Bay, we find her rocking gently. There’s hardly any wind and the swell is creeping up from the north side of the island. And soon we have a few visiting mosquitoes too. We hadn’t missed either the rocking nor the mosquitoes in Salt Plage. No wonder so many super yachts chose to anchor there. Tomorrow we have a hire car. It would probably only take us 1 hour to drive the circumference road around the entire island – but it seems there is a lot to see on this small island. 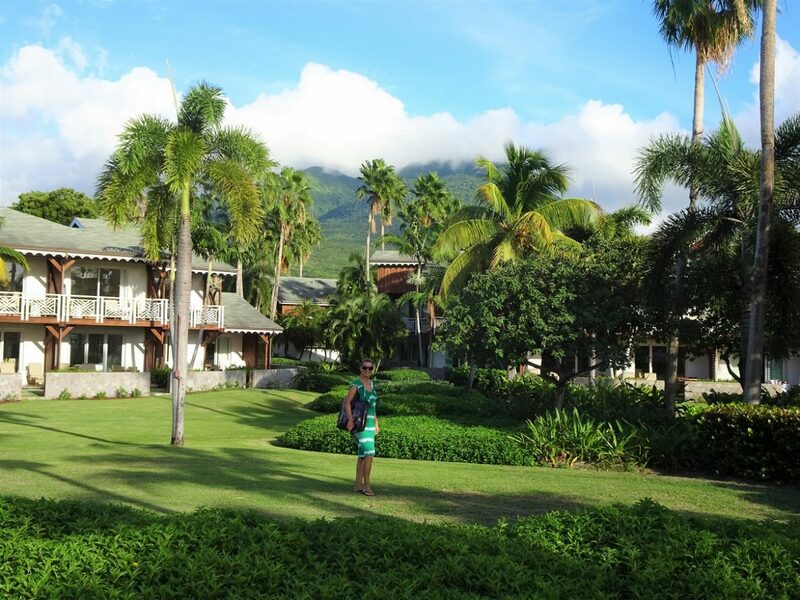 Volcano to climb, plantation estates and the church where Lord Nelson was married to visit, kiting beaches and more. Tomorrow we will be tourists again. Our 20th island in the West Indies.